Cumulative exposure to sunlight damages structural proteins and other molecules needed to keep skin firm and supple. This photoaging of skin eventually results in an aged appearance. Olus and Camelina sativa Seed Oils: This unique botanical blend, with its natural tocopherols, supports skin barrier function and hydration better than other essential fatty acids that are more susceptible to oxidation6—protecting against dry and scaly skin. Palmitoyl Oligopeptide: This oil-soluble peptide promotes production of the key molecules collagen and hyaluronic acid—shown to result in a near 20% reduction in appearance in wrinkle depth. Marula Oil: This fruit extract of the marula tree (Sclerocarya birrea) is rich in oxidation-resistant compounds that support collagen production8—proven to revitalize skin and reduce the appearance of wrinkles. Retinyl Palmitate: This retinol form of vitamin A inhibits collagen breakdown, stimulates collagen formation, and promotes keratinocyte production and epidermal thickness—resulting in reducing the appearance of wrinkles and improved evenness of skin tone. 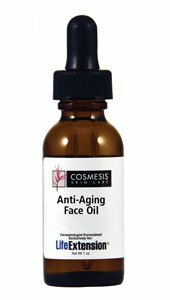 Applying one to two drops of Cosmesis Anti-Aging Face Oil morning and night to clean, dry areas of the face results in rejuvenation of the appearance of photo-aged skin for a vibrant, more youthful appearance. Ingredients: Safflower Seed Oil, Jojoba Seed Oil, Squalane, Argan Kernel Oil, Sclerocarya birrea Seed Oil, Retinyl Palmitate, C12-15 Alkyl Benzoate, Sorbitan Laurate, C18-36 Acid Glycol Ester, C18-36 Acid Triglyceride, Palmitoyl Tripeptide-1, Palmitoyl Tetrapeptide-7, Camelina sativa Seed Oil.